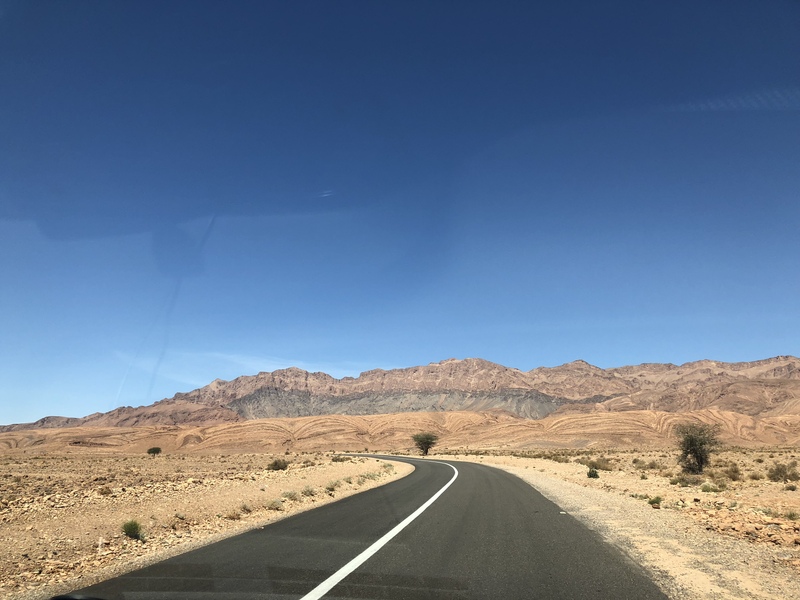 Before landing in Morocco, i read a lot about driving there: what experiences had people had, any particular rules i should know about, things to watch out for, and so on. I learnt a lot, almost all of which turned out to be wrong. The pre-emptive trauma that i had cultivated dissipated rapidly as reality set in. Don’t get me wrong: driving in Morocco is chaotic. People switch lanes randomly, the road is cluttered with animals and pedestrians, and finding yourself facing oncoming traffic in the wrong lane was a daily affair. But it was an overall friendly experience, and there weren’t really all that many cars out there. Certainly fewer than i would encounter in central London. The thing that really struck me was connectivity. I drove 3,000km, down empty motorways, freshly laid tarmac roads, and unpaved dusty tracks. Much of the infrastructure was new, gleaming surfaces with almost no users. Which made it great for me. Some days i drove for hours, hitting nothing in particular: broad, wide open, glacial plains, bordered by mountains, wide open skies, with almost no contact with people, except at the regular small towns or villages, each with a gas station, cafe, collection of houses. One man i met in the Sahara described how his uncle had made a two month trek, with donkeys, to Fez. It had taken me four days to drive it, in no particular rush. Roads connect, and connection drives change. Connectivity comes through physical connection, but also through the connection of worldviews. Whilst driving through the country, one other factor was very clear: that global culture was rapidly eroding, or at best evolving, traditional culture. Culture can be held safely when it’s isolated, but as transport improves, trade broadens, brands globalise, media proliferates, and ideas spread, it is assailed by new influences. The guidebooks and internet told me that i would be approached by children, offering to guide me through the maze of the medina in Fez, but it failed to tell me that many of them would be sporting the ripped jeans, leather jackets, and asymmetric buzzcut hair that would have looked more in place in Paris or London. Or New York, or Amsterdam. Whilst stylistic norms are not global, they are certainly globally influential: identikit styles pervade youth globally, and traditional styles are plundered cross culturally for inspiration. Which is, of course, a great thing: knowledge wants to spread, and art, or creativity, is fuelled by this spread. The challenge comes less from what we gain, more from what we lose. Cultural artefacts, traditions, grammar, and behaviour, do not persist indefinitely. If they lose relevance, or if they lose a certain level of penetration and adoption, they fade away. Much of this change is good, but we should seek to fully understand the cost. I, myself, like a good pair of jeans, so by what right would i deny them to a teenager in a remote community? In the name of protecting their culture? It would be radically unfair to use legislation to restrict access or the cultural transmission of information. But equally, part of our identity is held in opposition to global ideas, part of our tribal and cultural identity must be held locally, or else we lose the notion of ‘local’ in any meaningful sense. I sensed some of this in conversations with nomads, herders, traders: the camel driver lived in the local town, not a tent. He drove his Land Cruiser out to the herd, instead of settling down under the stars. He supported Liverpool and loved my Polaroid camera. All these things are good, but things that are central to our way of life first become conscious scripts, then historical remnants. We act out the truth of history. Then we simply forget or memorialise it. I would not want to be a nomad (although it feels like it sometimes! ), because i like having a washing machine, and Netflix. I felt the transition in Morocco: a new and improving road network, widespread cultural proliferation and change, shifts in social organisation and habit, erosion of legacy patterns of movement, urbanisation and urban magnetism, all shifts in social structure. Much is good, but we must never blindly ignore, or refute, the cost: the things that make us who we are, the things that we value most deeply, these are not cast in stone, but held in the shadow of culture. This entry was posted in Writing and tagged Change, Culture, Fashion, Morocco, Roads, Transport, Travel Writing, Writing. Bookmark the permalink. part of who we are – people and place. really good post Julian, shame there is not more transfer from other cultures into our own. The value put on western culture artefacts etc is a shame, particularly when it erodes other cultures.